Courtesy of Mylène Farmer for the campaign "Human Rights Defenders against the Death Penalty in Belarus"
On October 24, three days before her arrival in Minsk, where Mylène Farmer is expected to present to the public her new show “Timeless”, she signed a petition of the campaign "Human Rights Defenders against the Death Penalty in Belarus." The well-known French singer did not remain indifferent to a letter from the International Federation for Human Rights (FIDH) and the Human Rights Center "Viasna", in which human rights activists told her about the nature of the problem of the death penalty in Belarus - the last country in Europe, where people are still deprived of life on behalf of the state. "There can be no higher goal, more holy, more worthy than this one: abolish the death penalty," Mylène Farmer quoted these lines when signing the petition. They belong to the French writer Victor Hugo, who in the preface to the novel "The Last Day of a Condemned Man" (1829) expresses his feelings that the death penalty should be abolished, wondering why one person has the right to take the life of another and claiming that his role is "the role of patron for all possible defendants, either guilty or innocent, before all the courts and the tribunals, before all the jurors, before all the arbiters of justice." The petition calls on the Belarusian authorities to abolish the death penalty in the country: "Today, when all the countries of Europe and the former Soviet Union have abolished the death penalty, it is time for Belarus to join the civilized space of humanism, a space free from murder by the state." 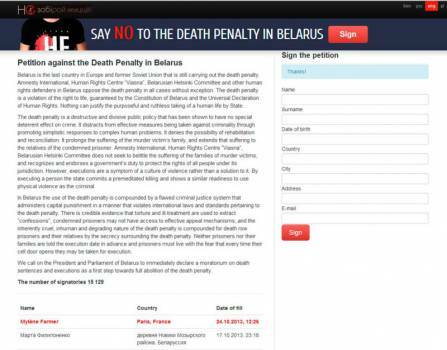 Activists of the campaign "Human Rights Defenders against the Death Penalty in Belarus", launched in 2009, suggest signing the petition to the world-famous individuals – to emphasize the importance of the problem and to attract the attention of people all over the world to the death penalty as a problem that knows no national boundaries. In 2010, the petition was signed by the famous British musician Sting, who also recorded a video message entitled "Time to Change", and in 2012 the campaign was supported by the Swedish singer Loreen, the winner of "Eurovision-2012".